A Note on Triumph was commissioned by Italian violinist Jacopo Bigi for the 2009 High Score Festival in Pavia, Italy. It received its American premiere at Hertz Hall in Berkeley by violinist Nils Bultmann. A Note on Triumph was made possible with support from the Center for New Music and Audio Technologies (CNMAT) at UC Berkeley. A Note on Triumph is an interplay between audio theatre and live instrumental performance. It is an adaptation of Norman Corwin’s radio classic On a Note of Triumph (1945), which, unlike most radio classics of the 40’s-50’s, is carried through by a single narrator (similar to the more experimental works of Beckett and Cage). As I reorganized the hour-long play into approximately two-dozen sentences, I maintained a montage-like principal in working with both the text and musical material. The result is a series of scenes that are strung together by a violinist who constantly shifts from background to foreground. Hertz Hall, Berkeley, CA, 15 March 2009. 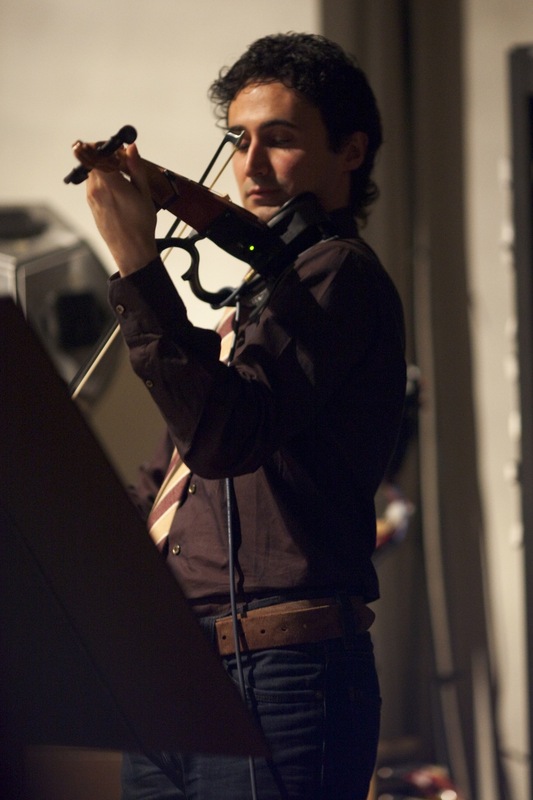 Nild Bultmann, Zeta electric violin. HighScore Festival, Pavia, Italy, 17 July 2009. Jacopo bigi, Yamaha electric violin. Mauro Ceccanti, Yamaha electric violin.